People have been enjoying yogurt for thousands of years, with goat yogurt potentially being one of the earliest forms of the food, according to Michigan State University's Dairy Review. 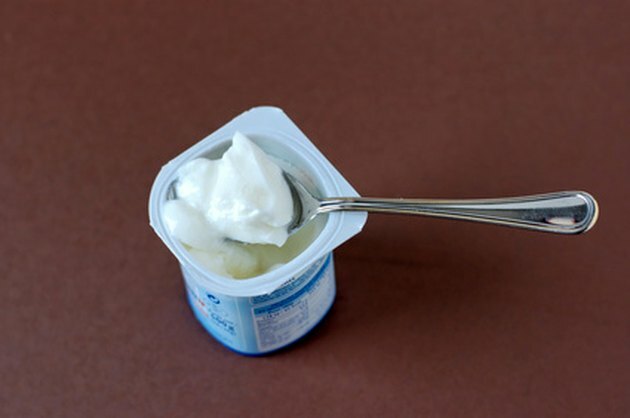 Many yogurt products contain live active bacteria cultures containing bacteria like Lactobacillus acidophilus, reports the University of Maryland Medical Center. When you eat it, you may experience several potential health benefits. Antibiotic medications kill all bacteria in your body, including both the bad organisms and the beneficial ones that line your digestive tract. Eating yogurt with active bacteria cultures helps to replenish your digestive tract after treatment with antibiotics, reports the National Center for Complementary and Alternative Medicine. The center, a branch of the National Institutes of Health, also states that eating live yogurt can help ease the side effects commonly associated with antibiotics, such as gas. Bacteria in yogurt may help enhance your immune system, notes Roger Clemens of the University of Southern California's school of pharmacy. The bacteria, says Clemens, "modulate our body's immune system...to ward off potential infections." The consumption of yogurt and other products containing beneficial bacteria cultures can help treat diarrhea, according to the University of Maryland Medical Center, although its efficacy depends on the reasons you're experiencing diarrhea. For example, the center says it's effective for traveler's diarrhea -- loose stools caused by contaminated or spoiled food -- and rotavirus-related diarrhea. Yogurt contains high amounts of calcium, which can help maintain bone and tooth strength. The United States Department of Agriculture's national nutrient database notes that the average cup of yogurt contains a whopping 448 mg of calcium. Additional beneficial nutrients include more than 12 g of protein and 573 mg of phosphorous. People who are lactose intolerant often can't enjoy dairy products without experiencing negative digestive issues like bloating and cramps. Not so with yogurt made with live cultures. The National Digestive Diseases Information Clearinghouse reports that the bacteria in the yogurt helps break down the lactose to make it easier to digest compared to traditional dairy products.